Qualifying two throwers in different events for the Olympics is a dream come true for any coach, including John Smith of the University of Mississippi who accompanied shot putter Raven Saunders and hammer thrower Gwen Berry to the Rio Games. Unfortunately, the women’s shot prelims and finals took place on the same day as the hammer prelims, making August 12 probably the busiest, most pressure-packed day of Coach Smith’s life. I talked with John a couple of days later, and asked about his impressions of the Rio Games in general, and more specifically how he survived his big day. Coach, what were the accommodations like in Rio? I stayed with the other coaches at the hotel for personal coaches of high performance athletes. It had air conditioning and toilet paper, so it was pretty good. The US has a naval base that belongs to the Brazilian navy and there’s a track there and a weight room there. Basically my time was spent going to the track, practicing and lifting. Did you lift at the naval base? Yes. They had a US-only training place. It is right on the ocean. You could see the sailing competitions from it. If you saw the sailing competitions on TV that’s where our track was. What was it like getting around? They had shuttles for us to and from the practice track every day. Everything was there at the naval base. The weight room was like the Chula Vista weight room. They even had a safety squat bar that I requested. We were able to do everything training wise that we needed to do just like we would at home. Because of that, our athletes were prepared and ready to go. Compared to other Olympics, it was unbelievably accommodating for the coaches. USATF and the USOC gave us a chance to do what we needed to do. This was my fifth Olympics and you could tell the organizers weren’t ready. The day we finally got to go to the stadium. they had just put in toeboards at the practice track the day before. And they were building the cage inside the stadium the day before. But, at least they had an Olympic lane on the streets so we could avoid the traffic. Even with that, for the athletes it took an hour to get to the naval base and an hour to go from the village to the stadium. It pretty much took an hour to go anywhere important. Did the streets feel safe? You had to be careful. Where we were at there were bars on the windows, metal doors. There were even bars on the windows on the second story. You had to be happy with Raven getting a PR of 19.35m and finishing fifth. She was pissed afterwards that she didn’t throw 65. She only has one speed–all out. She is fearless and that is what makes her great. I expect her to throw 66 feet next year. The only think I may add to her repertoire is I may have her lose a little weight and I may add push jerks. Are you planning on adjusting her diet? Yes. There is a lot of room for improvement in her diet. I’d like her weigh about 245. How would the push jerks specifically help her? How did Gwen look leading up to the Games? Gwen was ready to go. She threw the 3k 280 feet in training, but this was Gwen’s first time, and the failure rate the first time at an Olympics or Worlds is 85-90 percent. Can you take us through your day on August 12 when both girls competed? I got up at 5:30 to catch the 6:30 bus, but it got lost on the way to the track, so it took an hour and fifteen minutes to get there when it should have taken 35 minutes. I had to go get my credentials to get in the practice track, and once I got in, I had Raven take a non-reverse half-turn and a non-reverse full, another non-reverse half-turn and non-reverse full. I had her take a full throw to see that everything was balanced okay, then I took her to the waiting room and went inside the stadium. She fouled her first throw then hit the automatic qualifier (18.40m) on her second throw (18.83m), which for someone in their first Olympics is fantastic. I thought it would take 18-meters to qualify, so for several weeks we practiced twice a day where I would give her four warm-up throws then she would get three throws to throw 18 meters with the 3.75k, then she would go home. We did that for ten weeks. We got to the point where I was comfortable that she could make it. Then the day before the competition we were going to rest, but it started to rain, and there was a chance it would rain the next day in the competition, so I took her to the track and had her take some throws to get used to those conditions. She threw about 63 feet with the 3.75k. After the shot qualifying, they had a car for me, Michael Carter (father and coach of Michelle), and Larry Judge (coach of Felisha Johnson) to go back to the hotel. I felt bad for Michael because the airline lost his bags and he ended up wearing the same clothes for six days. We got back just after noon, and I went to have something to eat at a smorgasbord where you put your food on the plate and pay by the pound. I left on the 5:30 bus to go to the track again, and this time I had Gwen getting ready for the prelims, but the warm-up area for the long throws was at a different practice track, so I had to go back to the stadium and then take a shuttle to the long throws track, which looked like a vacant lot with a hammer cage on it. From there they took the girls to the call room, and they had another bus to take the coaches back to the stadium. While you were at the warm-up track with Gwen, where was Raven? She was at the warm-up track at the stadium and Connie was there. (Note: John is married to former Olympian Connie Price Smith who was the head coach for the women’s track team in Rio). So you were positioned to manage that potentially difficult situation. Yes. And if Gwen ended up in the second flight, which competed when Raven was throwing, JC would have coached Gwen. (Note: “JC” is JC Lambert who Smith coached at SIU and who took over as throws coach there when the Smiths moved to Ole Miss) He’s worked a lot with Gwen, so it would not have been a problem. Anyway, it worked out well that Gwen was in the first flight, because the second flight competed during the women’s shot final, so when Gwen was done I just walked around to the other side of the stadium, and Raven was already warming up. I never did get to see Raven after the competition. Connie did, but I had to catch the 11:30 bus back to the hotel. Yes. I had one fantastic performance and a girl that came up a little short and still had a lot of emotional baggage. Gwen felt like she had something to prove instead of just getting in there to throw. After the whole thing with the asthma medication, she felt like she had to prove that she wasn’t on drugs. I hope so. Whenever an athlete has a disappointing Olympics they sort of re-think their career. But I think she will. She has tons of potential. Sandra Perkovic of Croatia is going to win the women’s disc. -She opened the season with a 70.59m toss on March 6 in Split. 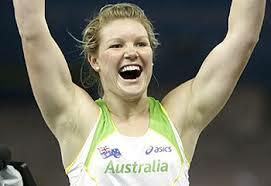 -She threw a 70.88m world-leader on May 14 in Shanghai. -She threw 69 meters twice in July, most recently 69.94m in London on the 23rd. -All in all, she has six of the top ten throws of 2016. -Beyond that, she is quite simply the best women’s discus thrower in history, and at the top of her game. I know, I know, her PR of 71.08m is the 85th best throw of all-time. But throws 1 thru 84 on that list took place between 1981-1992, and all but one of them was made by an athlete from the Eastern Bloc. That one throw (71.22m, number 78 on the list) was produced by Ria Stalman of the Netherlands who, earlier this year, shocked the world by admitting that she took supplements other than vitamin C during her career. Yaime Perez of Cuba threw 68.86m in Havana in February. She followed that up with a 67.91m in June, also in Cuba. For the past two months, though, she has not been impressive. Yaime’s teammate, Dania Caballero, won the World Championships last year by hammering a 69-meter first round toss that Perkovic could not answer. This year, her best of 67.62m came June 29 in Portugal after she was destroyed by Perkovic in Stockholm and Oslo. Nadine Muller of Germany took the silver last year in Beijing with a 65.53m toss. 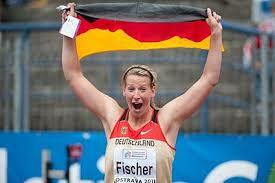 This year she won the German championships with 65.79m–her season’s best. We are wondering, though, if something is up with her health, as she finished fourth at the Euros (62.63m) and then threw 59.95m at the London DL meeting. 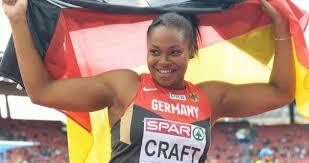 Shanice Craft, also of Germany, has thrown 64.62m this year, and finished third at the Euros. She is super consistent, but at twenty-three-years-old may not be ready yet to bust a 66m and get in the hunt in Rio. Then again, I did not think her countryman Daniel Jasinski had a prayer of getting on the podium, and we know how that turned out. Dani Samuels of Australia was the World Champion in 2009 but has not medaled at a major meet since. Why, I do not know. This year, she hit 67.77m in Shanghai in May, so she has the horsepower to get on the podium in Rio if she can find her form. Germany’s Julia Fischer finished fifth in Beijing last year with a 63.88m toss, and earned this season’s European silver (65.77m). She also threw a huge PR of 68.49m in May. Here are Trofimuk’s predictions. I disagree, which is why he is currently locked in the basement. Bronze: Cabellero. She’s not producing the results she was last year, but is for sure capable of going 66+. Silver: Fischer. Is she ready to pull a Chris Harting and take the leap to the big time? Why yes, she is. Unfortunately, and this is not a dig at Piotr Malachowski, no matter how far she or anyone else throws, Perkovic will throw father. Gold: Perkovic. She was banged up last year, and could not respond in her usual honey badger style when Caballero killed one in the first round in Beijing. That will not be the case in Rio. If she has to, she will go 70+ to get the win. Trofimuk and I disagree on this one, but twenty years of marriage has trained me to avoid conflict by employing subterfuge, and since I have the password to the blog and he doesn’t…here’s what I think. This is going to be a two-man battle for the gold, with the bronze medal totally up for grabs. Mason Finley of the United States created great expectations for himself at a very young age by one, being ginormous, and two, breaking the all-time high school record in the disc. Seven up and down years later, he came up yuuuuge at this year’s Trials, hitting a PR 66.72m in the prelims and following that up with 63.42m for the win in the rain-soaked final. Trofimuk and I became fans of Mason when we interviewed him in Des Moines at the 2012 NCAA meet. At the time he was getting a lot of career advice from courageous internet trolls who were outraged that he was taking too long to develop into the next great American thrower, so we were afraid he might be a little surly with us media types. But he could not have been more gracious. He kind of fell off the map after graduating from the University of Wyoming in 2014, and we had no idea what he was up to until last summer when Mac Wilkins told us that Mason had spent a few months at the Chula Vista training center and had shown a lot of potential while there. He picked a great time, this Olympic year, to start realizing that potential and even though he is unlikely to get near the podium in Rio, if he can make the final and then stay in the game for another four years he may fulfill those expectations after all. 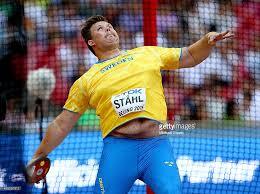 Daniel Stahl of Sweden finished fifth in Beijing last year. Twenty-five-years old, athletic and having just hit a PR of 66.92m last month, he is definitely a threat to medal in Rio. 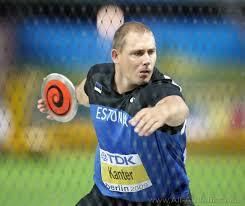 Can it be eleven years since Estonia’s Gerd Kanter announced himself as the next great discus thrower by blasting a 68.57m toss at the 2005 World Championships in Helsinki? Virgilius Alekna came up big on his last throw to prevent Kanter from claiming the gold that night, but for Kanter, Helsinki was the beginning of a streak of dominance that included winning the Beijing Olympics and breaking the 70-meter mark in six consecutive seasons. 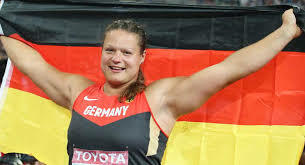 The emergence of a certain German as maybe the best big-meet thrower in history (more on that below) pushed Gerd out of the limelight, but he remains a fierce competitor who rises to the occasion. Don’t forget, he came within a few centimeters of defeating that…uh…German fellow in London. Kanter’s best this season is the 65.27m he threw to take bronze at the European Championships. That won’t be enough to get him a medal in Rio, but don’t be surprised if this cagey veteran nails a season’s best and gets himself into the hunt. 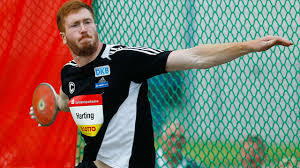 Younger, taller, and mellower than his famous brother, Christoph Harting of Germany has flashed signs that he might be ready to succeed big bro as the best discus thrower in the world. 2015 was a breakthrough season for Chris, as he upped his PR nearly three meters to 67.93m and came within a phantom foul of medaling in Beijing. This year he threw 68.06m early and has been consistently in the 65-meter range since, taking fourth at the Euros with 65.13m. It can’t be easy operating in the shadow cast by big brother, and you hate to place too much importance on a single competition, but medaling in Rio would be a giant step in this young man’s career. 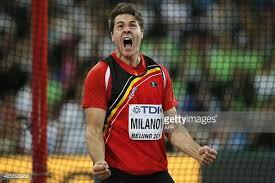 Philip Milanov of Belgium threw 66 meters in June of 2014, then must have gotten either injured or kidnapped because I was at the European Championships that August and do not recall seeing him throw. So, I was surprised as anyone last year when he broke the Belgian record with a 66.90m toss that got him the silver in Beijing. 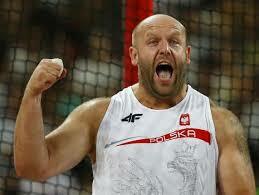 He hit a PR 67.26m this May, and finished second at the Euros with a 65.71m toss. If anyone could challenge the two Big Dogs (more on them in a moment) should they falter, it would likely be Milanov. 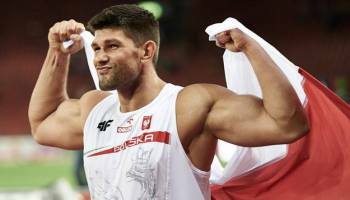 Robert Urbanek of Poland announced himself as a world class thrower with a 66.93m toss in 2012, and helped Poland to a 1-3 finish in the disc last year in Beijing by tossing 65.18m to take the bronze. He struggled at the Euros last month, finishing ninth at 62.18m. His best this year is 65.56m., and in spite of his struggles in Amsterdam, I see him as a twenty-nine-year-old version of Kanter in that he can be relied on to throw 65-something under pressure in a stadium. However, if things get nutty in Rio and it takes 68.00m to medal he will likely be out of luck. …Robert Harting of Germany, the Dark Prince of the Discus, the Beast from the former East is back, and the beast…is…hungry. I know this from personal experience. In March of 2015, four months his surgery for a torn ACL, I attended one of Harting’s practices. At the time, he was determined to get the knee ready for a defense of his World title that August in Beijing. I had interviewed him a year earlier and he had seemed like a pretty friendly guy, so of course I said hello as I approached the discus cage. He turned around, shirtless and looking mighty buff, and literally growled at me. A sane person probably would have dropped his notebook and made a run for it, and don’t think I didn’t consider it, but instead I just wet myself a little and then stuck around to watch as he treated every stand throw, every full, every imitation like it was round six of the Olympic final. His intensity was so intimidating that I climbed to the other side of a small fence that surrounded the throwing area just to signal that I was staying the heck out of his work space. In hindsight, I think that accounts for the difference in his demeanor between the first couple times I met him and this particular moment. He didn’t mind having a semi-annoying American asking him a bunch of questions in a hotel lobby or as he relaxed at the track after a competition. But when it was time to work on his craft…well, that was a very different story. As noted above, he was not able to make it back for the 2015 World Championships, and there were a couple of moments this spring when a torn pec and more trouble with the repaired knee threatened to derail his career for good. Then came the final round of the German Championships. The winner would receive a guaranteed spot in the Olympics. Everyone else would have to continue battling another three weeks for the remaining two slots. Robert wanted to secure that automatic bid so he could begin to focus strictly on Olympic prep, but as he stepped in for his final effort his brother sat in first place at 66.41m. I doubt anyone in that stadium was surprised by what happened next. Certainly Malachowski wouldn’t have been. A 68.04m bomb. Robert’s best throw in two years. The automatic bid secured. Order restored. Trofimuk is a big guy, and it would hurt to be punched by him, so I am going to go ahead and give his predictions even though they are completely wrong. Bronze: Chris Harting. He was also at that March 2015 practice and was super nice. Didn’t growl at me even once. For that, I am forever grateful. Silver: Malachowski. I met Malachowski at the New York Diamond League meeting a couple of years ago. He is a really nice guy, and after we chatted for a while I thanked him for his time and told him I thought he was a great thrower. “Maybe,” he replied, “but Harting always beats me.” Unfortunately for Piotr, that trend will continue in Rio. For a track coach, having one or your athletes make the Olympics has got to be an amazing feeling. What I wondered though, watching the recent Olympic Trials, is “What happens next?” How do you deal with the logistics of coaching your athlete through the biggest meet of their career, especially when you factor in the unique difficulties presented by the current situation in Rio? University of Wisconsin throws coach Dave Astrauskas was kind enough to talk about his experience in preparing to coach discus thrower Kelsey Card at the Olympics. First of all, Dave, as a coach you work non-stop to get an athlete to the Olympics. Then, what happens? Does USATF or the USOC support you with info/advice on how to proceed? Does the University support you? Can you give me an idea of how you even knew where to begin in terms of logistics, scheduling, etc…? I guess I had a general idea of what to expect from being at several USATF High Performance Summits when I coached a javelin thrower named Alicia DeShasier a few years ago. 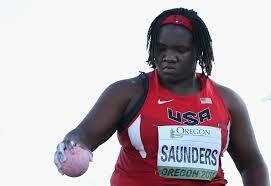 After the discus competition at the trials I went through USATF team processing with Kelsey the following morning. This was when I learned A LOT about how the next 6 weeks would play out. While at processing, we had to decide on a Rio arrival date, a Rio departure date, whether to participate in opening/closing ceremonies, and when to go to the ‘other’ team processing. I also learned about the lay of the land in Rio and how long travel times may take to get from one location to another. I was introduced to the women’s Olympic throws coach and she explained how communication between myself, Kelsey, and USATF would work. I was made aware that a US practice venue had been secured and that would be where we would train leading up to the qualifying round. A practice schedule for the venue was also presented. I also learned the pros and cons of lifting at the weight room located at the Olympic village. I was told what implements would be made available at the practice facility and we were able to request some additional discs. They shared with me some precautionary things I could do to ensure better health while in Rio. It was also explained to me that USATF had secured housing for some of the personal coaches and that there was a pecking order so I would have to wait to see where I would end up if I got housing at all. I was also made aware of the ‘other’ (USOC) team processing in Houston, TX, that was also mandatory. As for me personally, I am blessed to be employed by the University of Wisconsin. Wisconsin treats me well and UW supports our track & field / cross country program in almost every possible way. Wisconsin will cover my airfare and room & board. I ended up getting housing that was secured by USATF and is only 10 minutes from the practice venue. I called our UW travel agent and I had my flights to Rio before I left Eugene, OR. I learned from our agent that a rental car was not the way to go and that public transportation and taxis would suit me better. Our UW travel agent was helpful because she had already been through this with our swimming coaches. I also received advice/suggestions from several people from the time I knew I was going to Rio until now and they are Nate Davis (UW Assistant Coach), Connie Price-Smith (Women’s Olympic Head Coach), Jerry Schumacher (Bowerman Track Club Coach), John Smith (Ole Miss Throws Coach), Bonnie Edmondson (Olympic Throws Coach), Art Venegas (USATF Coach), Greg Watson (Kansas St. Throws Coach) and Brett Halter (Mizzou Head Coach). What were the pros and cons of working out at the weight room in the Olympic Village? The pros were basically the location and you are able meet a lot of athletes from different countries. The cons were it is open to all types of sports so it will be crowded. As a coach I would have to commute approximately 40 minutes. Also, it is not near the US training facility so we’d be unable to lift directly after a throw session. Ultimately, Kelsey will lift at the Olympic Village one time and lift at the US training facility 3 times. What advice were you given about the Zika situation? I was made aware of the risk and was told to find an insect repellent. So, I bought Sawyer’s Fisherman Formula with picaridin which was ranked the best by Consumer Reports in a recent study with the aedes mosquito which carries the zika virus. Yes, I am a research/science geek! Speaking of science, did they talk at all about the possible ramifications of contracting Zika? Did they give you any updates regarding testing and transmission? I know that part of being an elite athlete is blocking out distractions, so I’m wondering how you all are dealing with this cloud hanging over the situation. Not much else on Zika other than what I stated. I did not go through USOC processing with Kelsey so maybe she learned more there. The other cloud hanging over this Games that is not normally a factor is security, Not in the sense of terrorism, the prevention of which has been a worry of Games organizers for quite some time, but in the sense that the streets of Rio have a reputation for being somewhat dangerous. Were you given any advice on that? Like Tom Walsh on the men’s side, Michelle Carter of the United States rolled the dice on a double peak in this Olympic year and the early returns were outstanding: a monumental 20.21m toss on her final throw in Portland for the win. Unfortunately, she injured her back on that attempt and has yet to regain top form. Her best toss so far outdoors was her 19.59m winner at the Trials. Her ability to medal will depend entirely on her health. When fit, she has the experience, toughness, and horsepower to compete with anyone. 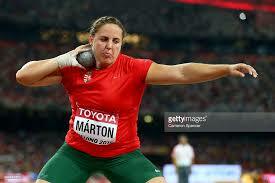 Like Carter, Anita Marton of Hungary went all-in for Portland, blasting a sixth-round 19.33m to take the silver. 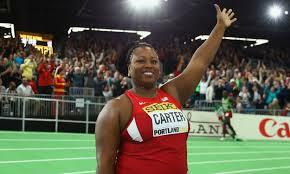 Unlike Carter, she has been able to surpass that sterling performance outdoors, hitting 19.49m earlier this month. Twenty-seven years old and possessing fine rotational technique, she is in her prime and throwing great. Unfortunately, at this Olympics it may well take 20 meters to medal, and that is out of her range. She’ll make the final, but not the podium. Another rotational thrower likely to make the final in Rio is Raven Saunders of the United States, the twenty-year-old enfant terrible of the women’s shot. She set the NCAA meet record of 19.33m in June, followed that up with 19.24m to take second at the Trials and, under the direction of veteran Coach John Smith, will likely surpass 19 meters again at the Olympics. A top five finish would be a huge accomplishment, and if we had to pick an early favorite for Tokyo, it would be her. My money is on Felisha Johnson to make the final as well. She hit a PR of 19.26m in a low-pressure meet at North Central College in beautiful Naperville, Illinois, this summer (full disclosure: I live there) and backed that up with a 19.23m toss at the highest high-pressure meet of her life: the Trials. A similar distance won’t get her anywhere near the podium in Rio, but hopefully she will find a way to stay in the sport and put her Olympic experience to use in Tokyo. 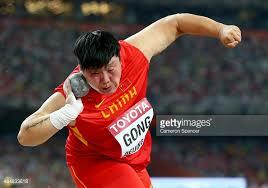 China’s Gong Lijiao has thrown at least 20 meters in seven of the past eight years including a PR of 20.43m two months ago, so I’m going to go out on a limb and say that she will very likely throw 20 meters in Rio and contend for the gold. Her most recent effort was a 19.73m toss on July 29. Since finishing 7th at the 2004 Olympics, New Zealand’s Valerie Adams has won two Olympic golds, four outdoor World Championship golds, and three Indoor World golds. She could finish 57th in Rio and still be considered by folks in the know (well, by me anyway) the best shot putter in history. Not that it’s been easy for her lately. Multiple surgeries kept her from throwing 20 meters last year for the first time since 2005. This winter, she took third in Portland with a 19.25m toss and began the long, slow climb back to the top. Unfortunately for the rest of the world, she appears to have made it. Twice this month, she surpassed 20 meters with a best of 20.19m on July 18th. It turns out that Val’s beloved coach Jean-Pierre Egger will not be able to make the trip to Rio due to a bum knee, but my guess is that his absence will only make Val more determined to bring home the win. 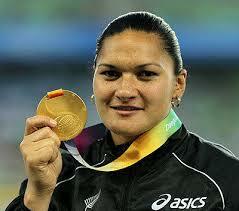 And a determined, healthy Valerie Adams will be hard to beat. Germany’s Christina Schwanitz won gold at the Worlds last year in Val’s absence, but got a late start this spring due to knee surgery. Like Val, though, she seems to be rounding into form just at the right time winning the European title with a 20.17m chuck. I’ve heard that a German biomechanics study determined that the base in her power position is inefficiently wide, but her fixed-feet glide technique reliably produces 20-meter throws with no fear of fouling. That makes her a formidable opponent in any big meet. Bronze: Carter. Having grown up in Texas with a former NFL defensive lineman (and Olympic medalist) for a father, she is not going to let a little thing like back pain slow her down. Silver: Schwanitz. The fixed feet glide can be deadly in a high-pressure meet. Gold: Adams. She’s been a dominant competitor and tireless ambassador for the sport for a dozen years. Plus, her brother (NBA star Steven Adams) can beat up your brother.